Jessamine County ( /ˈdʒɛsəmᵻn/) is a county located in the U.S. state of Kentucky. As of the 2014, the population was 50,815. Its county seat is Nicholasville. The county was founded in December 1798. Jessamine County is part of the Lexington-Fayette, KY Metropolitan Statistical Area. It is within the Inner Blue Grass region, long a center of farming and blooded stock raising, including thoroughbred horses. The legislature established a commercial wine industry here in the late 18th century. Jessamine County was established in 1798 from land given by Fayette County. 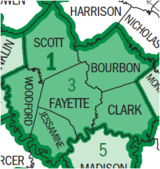 Jessamine was the 36th Kentucky county in order of formation. The county was named for Jessamine Douglass, the daughter of a pioneer settler. Most of the early pioneers were from Virginia, who came through the mountains after the American Revolutionary War. In the late 18th century, the Kentucky General Assembly passed a bill to establish a commercial vineyard and winery, based in Nicholasville and the first in the United States, known as First Vineyard. Wine making based on European grapes became widespread in the United States. After the Prohibition era, which lasted from 1920 to 1933, the county voted to prohibit alcohol sales. As it allowed an exception for the "wet" city of Nicholasville, where package alcohol sales are allowed, it is classified as "dry." The Chrisman Mill Vineyards is authorized to operate and sell its product in the dry portion of the county. According to the U.S. Census Bureau, the county has a total area of 175 square miles (450 km2), of which 172 square miles (450 km2) is land and 2.4 square miles (6.2 km2) (1.4%) is water. In 2000, nearly 129 square miles (330 km2) of the county's total area was dedicated to agriculture. The county's entire southern border is formed by the Kentucky River. Jessamine County's river bank extends roughly 42 miles (68 km) long due to meandering, and the river's scenic Palisades feature heavily along this border. As of the census of 2000, there were 39,041 people, 13,867 households, and 10,663 families residing in the county. The population density was 226 per square mile (87 /km2). There were 14,646 housing units at an average density of 85 per square mile (33 /km2). The racial makeup of the county was 94.44% White, 3.13% Black or African American, 0.20% Native American, 0.58% Asian, 0.03% Pacific Islander, 0.47% from other races, and 1.14% from two or more races. 1.31% of the population were Hispanic or Latino of any race. There were 13,867 households out of which 38.80% had children under the age of 18 living with them, 61.90% were married couples living together, 11.10% had a female householder with no husband present, and 23.10% were non-families. 18.50% of all households were made up of individuals and 6.50% had someone living alone who was 65 years of age or older. The average household size was 2.69 and the average family size was 3.05. The age distribution was 26.40% under the age of 18, 11.60% from 18 to 24, 31.10% from 25 to 44, 21.40% from 45 to 64, and 9.50% who were 65 years of age or older. The median age was 33 years. For every 100 females there were 96.60 males. For every 100 females age 18 and over, there were 92.80 males. The median income for a household in the county was $40,096, and the median income for a family was $46,152. Males had a median income of $32,340 versus $23,771 for females. The per capita income for the county was $18,842. About 8.40% of families and 10.50% of the population were below the poverty line, including 13.70% of those under age 18 and 9.90% of those age 65 or over. The Lexington Area MPO is responsible for transportation planning for Fayette and Jessamine counties. This includes activities such as carpool matching, administering a commuter vanpool program, air quality forecasting, bicycle and pedestrian planning, congestion management, and developing transportation plans and documents. ^ a b "State & County QuickFacts". United States Census Bureau. http://quickfacts.census.gov/qfd/states/21/21113.html. Retrieved July 20, 2015. ^ "Find a County". National Association of Counties. Archived from the original on 2015-05-10. http://www.webcitation.org/6YQozzgAf?url=http://www.naco.org/Counties/Pages/FindACounty.aspx. Retrieved 2011-06-07. ^ "Jessamine County". Kyenc.org. http://www.kyenc.org/entry/j/JESSA01.html. Retrieved April 16, 2013. ^ Collins, Lewis (1877). History of Kentucky. p. 396. https://books.google.com/books?id=F5FQAQAAIAAJ&pg=PA396. ^ Gannett, Henry (1905). The Origin of Certain Place Names in the United States. Govt. Print. Off.. pp. 169. https://books.google.com/books?id=9V1IAAAAMAAJ&pg=PA169#v=onepage&q&f=false. ^ "Wet & Dry Counties in Kentucky". Kentucky Office of Alcoholic Beverage Control. Archived from the original on 2007-03-15. https://web.archive.org/web/20070315092139/http://www.abc.ky.gov/NR/rdonlyres/88403470-8A7E-410C-9816-8B520F7649C8/0/WetDryList.pdf. Retrieved 2007-03-21. ^ "2010 Census Gazetteer Files". United States Census Bureau. August 22, 2012. http://www.census.gov/geo/maps-data/data/docs/gazetteer/counties_list_21.txt. Retrieved August 16, 2014. ^ "Jessamine County Agriculture Board Comprehensive Plan". University of Kentucky: College of Agriculture Food and Environment. 10 March 2008. http://www2.ca.uky.edu/anr/County%20Comprehensive%20Plans/2008%20Comp%20Plans/Jessamine%20Co%20Comprehensive%20Plan.pdf. Retrieved 16 October 2014. ^ "Kentucky River Blueway Project". Kentucky River Blueway. http://www.kentuckyriverblueway.com/?page_id=50. Retrieved 16 October 2014. ""Jessamine County has designated 42 miles of the Kentucky River, which is the county's southern boundary, as a Blueway Trail."" ^ "U.S. Decennial Census". United States Census Bureau. Archived from the original on May 12, 2015. http://www.webcitation.org/6YSasqtfX?url=http://www.census.gov/prod/www/decennial.html. Retrieved August 16, 2014. ^ "Historical Census Browser". University of Virginia Library. http://mapserver.lib.virginia.edu. Retrieved August 16, 2014. ^ "Population of Counties by Decennial Census: 1900 to 1990". United States Census Bureau. http://www.census.gov/population/cencounts/ky190090.txt. Retrieved August 16, 2014. ^ "Census 2000 PHC-T-4. Ranking Tables for Counties: 1990 and 2000". United States Census Bureau. http://www.census.gov/population/www/cen2000/briefs/phc-t4/tables/tab02.pdf. Retrieved August 16, 2014. This page uses content from the English language Wikipedia. The original content was at Jessamine County, Kentucky. The list of authors can be seen in the page history. As with this Familypedia wiki, the content of Wikipedia is available under the Creative Commons License.